Butyl gloves are specifically designed for use with solvents, and are rated to protect against acetone. They will protect against acetone in liquid and vapor form. So if you’re someone that dips pieces into vapor baths by hand, you should be using a butyl glove to protect yourself. Make sure you pick the one that fits your hand the best, because a good fit means you’ll be more likely to keep using the glove. Butyl gloves tend to last about four years depending on use, so you won’t need to throw them away after each use like latex gloves. Other gloves that rate highly for use with acetone are natural latex gloves or rubber gloves. 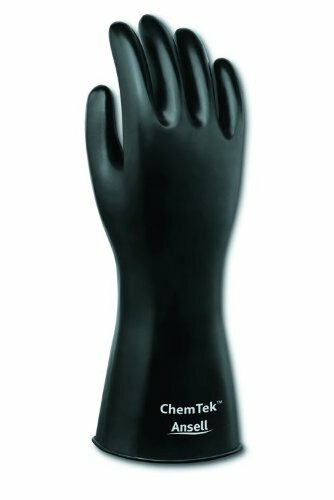 Standard nitrile latex gloves do not protect well against acetone. If you’re using the gloves for a vapor bath, you’ll need to find ones with a sleeve long enough to protect your forearms as well. Because they’re specifically designed for solvents, and rate very well against acetone, the top choice for protection against acetone baths are butyl gloves.